The final hours of heading into the trade deadline proved to be just as crazy as the days leading up to it. It was even crazier than last season’s trading spree. The biggest move of the trade deadline was actually a non-move. The Pelicans decided to stay put and keep Anthony Davis for the rest of the season. They didn’t accept the Lakers’ offer of young players and multiple picks because they’re waiting on other possible offers which can come in the offseason. One possible offer they’re looking at is the one reported by John Gambadoro. Danny Ainge was reportedly willing to offer Jayson Tatum and three first round picks for Davis. The Pelicans are waiting on other offers, including possible ones from the Knicks and Clippers. They will weigh when they have it all on the table. Right now, they’ll move forward this season and intend to play Davis, despite the risks involved with that. The biggest actual moves of the trade deadline was between two of the top teams in the Eastern Conference. 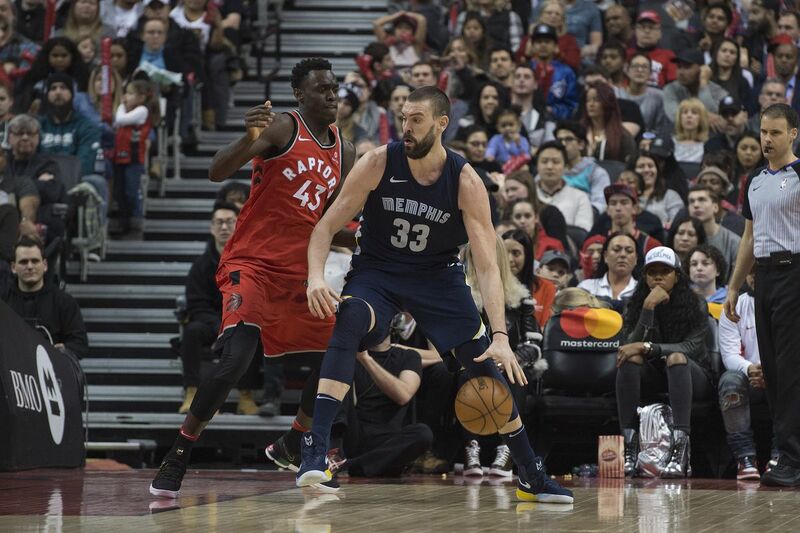 The Raptors strengthened their frontline by acquiring another solid two-way in Marc Gasol. They traded away Jonas Valanciunas and two key bench players to get the former All-Star. The Gasol to Toronto rumors were ringing loud in the days leading up to the trade deadline with Kyle Lowry’s name even being dangled in talks. The Raptors were able to give up Gasol without giving up their lead guard. This means Toronto can now trot out a strong defensive line-up that features Lowry, Danny Green, Kawhi Leonard, Pascal Siakam and Marc Gasol for the remainder of the season and the Playoffs. The Grizzlies are now in full rebuild. They traded away their former franchise player for younger, cheaper assets. The buzz was they were looking to move Gasol and point guard Mike Conley during the trade deadline. But they decided to keep Conley and try to find a new home for him in the offseason. The East definitely has an arms race. Hours before the Gasol trade and days after the Sixers move to get Harris, the Bucks also made a move to strengthen their team. The Bucks flipped newly-acquired Stanley Johnson along with Jason Smith and several picks to acquire Nikola Mirotic from the Pelicans. With one move Milwaukee not only adds more firepower but they also address a key weakness. Mirotic will bring addition outside shooting from the power forward position. He can play alongside the other Milwaukee shooters to space the floor for the Giannis Antetokounmpo. Mirotic also addresses the defensive weaknesses of Brook Lopez. Teams have been attacking Lopez defensively, forcing Coach Mike Budenholzer to remove him for other non-shooting bigs. When teams try this now on the Bucks, he can swap in Mirotic and play him at four with Antetokounmpo at center. The Pelicans are now slowly trading away key players to add picks and make way for a rebuild when Davis leaves. The Magic made a high risk, high reward move and added a point guard in the process (from The Process). Sources: Orlando is sending Jonathon Simmons to the 76ers for Markelle Fultz. They traded for last year’s top pick, the Sixers’ Markelle Fultz in exchange for Jonathon Simmons. The Sixers have switched on win now mode. They’re going all-in and can’t afford to wait on a player like Fultz. Philly acquires Simmons, a two-way wing that adds to their depth at shooting guard. Simmons is ready to contribute and play off the bench when needed. They also get a protected first round pick. As for the Magic, they paid a relatively low price for a potential franchise point guard. Fultz has been out of the Sixers’ lineup since the end of October. He’s currently rehabbing his injured shoulder, a misdiagnosed injury since his rookie year. Fultz has never lived up to the lofty standards that the Sixers had set for him. But in Orlando, he can start fresh and play under dimmed spotlights. The point guard-hungry Magic can use a player like him. He will be able to develop slowly with the other young players in the team. If he can get back to his form when he was in college, Fultz is a franchise cornerstone for Orlando. The Lakers continue to make moves, just not the Anthony Davis kind. In a confusing move, they traded awar Ivica Zubac and Michael Beasley to the Clippers for Mike Muscala, who the team got in the Harris trade. Sure, this move gives the Lakers a shooting big that they can use for a Playoff push. But Zubac was one of the pieces they were including in several trade packages to the Pelicans for Davis. Instead of keeping Zubac, they trade him away to make space for a potential buyout player to help with the rest of the season. Either that or LeBron James has finally found a way to bring in his friend, Carmelo Anthony. Good luck to the Lakers rolling the dice on Melo. Things started off slow with this Houston cap-saving deal. The Rockets lower their salary while the Sixers get a wing. The Rockets make another cap-saving move by trading away Nik Stauskas and Wade Baldwin (again!). Stauskas and Baldwin have been traded from the Blazers to the Cavaliers to the Rockets and now to the Pacers for second round picks. The Clippers free up cap space without having to give up picks. Jerry West and his team did a great job during the trade deadline this year. They trade away Avery Bradley and his $12 million salary for cheaper, yet serviceable role players. The Kings swapped young bigs with the Blazers. The Grizzlies make space for their new acquisitions. The final trade of the night was a buzzer-beater. The Raptors free up their frontline, sending Greg Monroe to Brooklyn. Whew. That was a wild four-hour stretch.